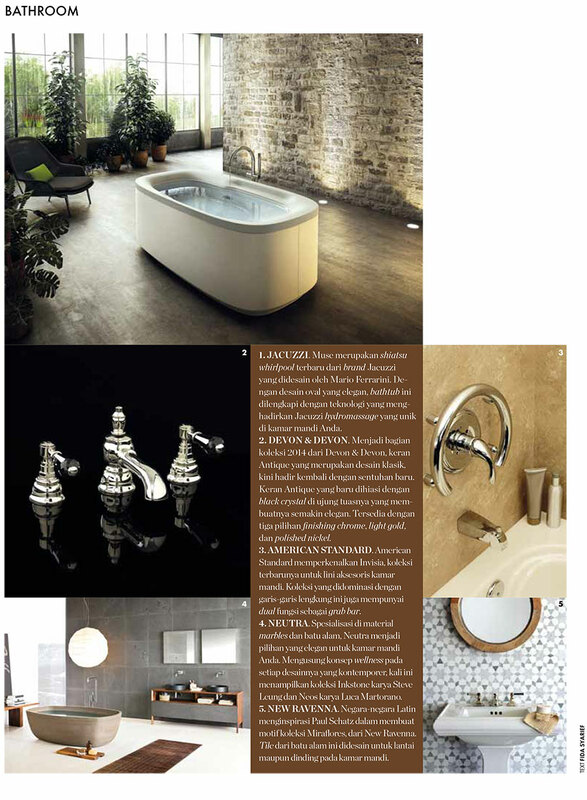 New Ravenna has been featured in Elle Indonesia, the magazine’s editors including Paul Schatz’s Miraflores collection in their bathroom highlights. The nod by this international magazine proves how far afield the appeal of the company’s tiles travels. Included in the tile roundup is the Medina pattern created for backsplashes. It is a handmade mosaic that is shown below in polished Ming Green and Carrara and honed Thassos; it is one of the designs in the Miraflores Collection by Paul Schatz, which is highlighted in more detail below the placement. The Miraflores Collection by Paul Schatz is a collection of eighteen mosaic designs was inspired by award winning interior designer Paul Schatz’s travels throughout the Latin countries of Spain, Portugal and Mexico, combined with his passion for Morocco and studies of Islamic geometric art. The hand crafted mosaics are complex abstractions of classic motifs. Miraflores, which means “to watch flowers” in Spanish, has a storied legacy of palaces, monasteries and neighborhoods in Spain and South America. The mosaics are created in natural stone and can be installed as floors and walls, inside and out. Paul Schatz started his firm Interior Design Imports in 1977. He works with both residential and commercial projects throughout the United States and Mexico. He lives in California and Mexico. New Ravenna Mosaics products are available at tile showrooms throughout the United States, Canada, Europe, and Dubai.